These door hangers come three per 8-1/2" x 11" sheet. Each door hanger measures 3-2/3" x 8-1/2". The hangers are made from thick cardstock paper and are micro-perforated for easy separation. The circle is cut out except for small "tic" marks that allow you to remove the circle quickly. The slit is also micro-perforated so you can easily separate and place the hanger over any doorknob. 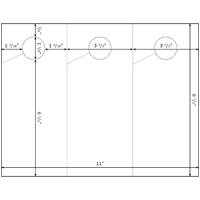 To see which of our products will work in your printer, use our Find Your Paper tool.